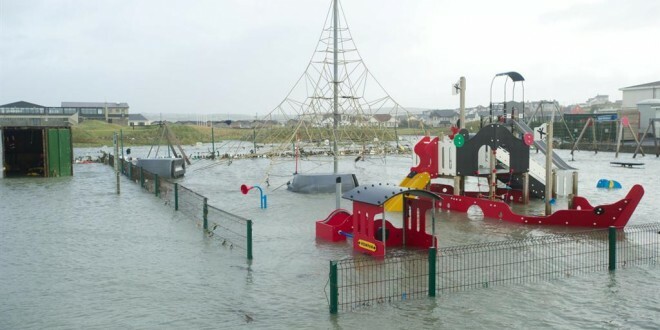 The playground in Lahinch, which opened in 2011, was badly damaged in the new year floods. THE new-year storms devastated many parts of the county but Lahinch was particularly badly hit. While the promenade was opened within a few days the playground, which the community fought so long to open, has been closed since. Despite their shock and disappointment at the damage done to the playground, the committee behind it have been stunned by the support they have received during the clean-up and now in their efforts to raise money for repairs. “We cannot get over it. It has been really outstanding,” said chairperson of the Lahinch Playground Committee, Nicola Hartigan, niece of the late Gerard Hartigan, who had led the charge for a playground in the North Clare resort for years. “I’m from Lahinch. I have lived here all my life. I would have thought that we weren’t that kind of community, you know that community based, but people have come out in droves to do what they can. It has shocked me. In difficult times, people have shown what they are made of. People have been so generous,” Nicola added. “We have fundraised since the beginning to make the playground a reality and it has been hard but people have really shown their support now. It wasn’t easy to raise the €200,000 originally but with all of this, what has surprised us is how supportive people have been,” she continued. In the immediate aftermath of the storm, people came out and helped clean up. “The playground was covered in glass. The council bottle banks had been swept across the playground and they were full because it was just after Christmas. The glass just sprinkled everywhere. We had chippings or pebbles under the climbing frame and they were scattered everywhere too. A group of local Tús/Rural Social Scheme guys were here and they swept them up and even sieved the chippings to get the glass out but we can’t take any chances, so we have to replace them anyway but that is just one example of the help we have gotten,” recalled Nicola. Open just three years, the committee members are heartbroken to see the playground closed again but the damage, according to Nicola, is not as bad as they first expected. “The equipment doesn’t appear to be structurally damaged, except for one piece. The groundwork of the playground though, we are not sure about. There are three beds under the equipment and we don’t know yet what we will need to do in relation to them. The fencing has been wiped out and the gates. The signage, the bin and all the works around it are all gone. We had a memorial brick wall, which had been a fundraising initiative when we were building the playground, that got knocked down with the high tide as well. Luckily, we didn’t lose any of the bricks themselves, they are still attached to the wall. People may not realise the costs involved in all of this. We hope to get figures in the coming weeks for replacement of the fencing, the gates and the groundwork but the chippings will have to be replaced too because of all the glass,” she outlined. 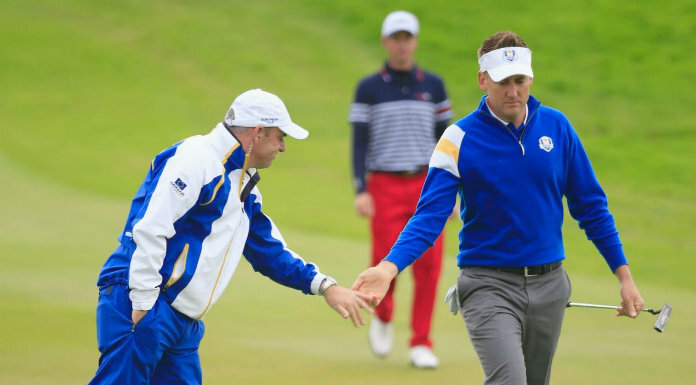 “Under one swing, there was a four-foot deep hole. I would nearly fit in it myself and that has sucked out the foundations and we don’t know what that has done to the foundations of other parts of the playground. The ground is unstable at the moment. We don’t know what the underground structure is like and that is why we have to keep it closed at the moment,” Nicola continued. Since the middle of last year, the committee had been trying to raise money to install a swing for children with disabilities in the playground. “That will still go ahead and we are trying to fundraise for that too. It is really important to us that kids with disabilities get the same play opportunities as those who don’t have disabilities. Through all the fundraising at the moment, we hope to get enough money to repair and reopen the playground but we would also like to be able to get a piece or two pieces of equipment for children with disabilities,” Nicola said. Among the fundraising initiatives undertaken by the committee is a welly campaign. “The welly campaign is going really well. We have left children’s wellies on countertops in businesses around the area and people can put donations into them. We thought it was really appropriate because it is a kid’s playground and it was underwater,” she outlined. Musician Daragh McGlynn wrote and recorded a song about the storm, which is available on iTunes, with money raised going to the Lahinch Playground Rescue Project. The song, Seaweed in Ennistymon, also features Luka Bloom, Yvonne Casey, Adam Shapiro, Jon O’Connell and Quentin Cooper. Other fundraisers include the Lahinch Frolics event at Lahinch Seaworld this Saturday. Ten acts, including musicians, story tellers, dancers and comedians, will take to the stage. On St Valentine’s night, a mini-festival of live music, Rock and Roses, will be held in the Claremont. The committee are also selling commemorative bricks for the other side of the memorial wall and, according to Nicola, nearly half are already sold. Lahinch Yoga Studio is also holding a yogathon for the project, set for Sunday, February 16.